Heat 1 tablespoon of the oil in a large heavy-based frying pan over medium heat. Add the cabbage, garlic and ginger and cook for 6 minutes or until soft. Place in a large bowl with the mince, chestnut, onion, egg, oyster sauce, salt and pepper and mix well to combine. Roll into 16 large balls. Place a wonton wrapper on a clean surface and place 1 meatball in the centre. Brush the edge with water and pinch the sides together to secure. Repeat with the remaining wrappers and meatballs. Sprinkle with the sesame seeds. 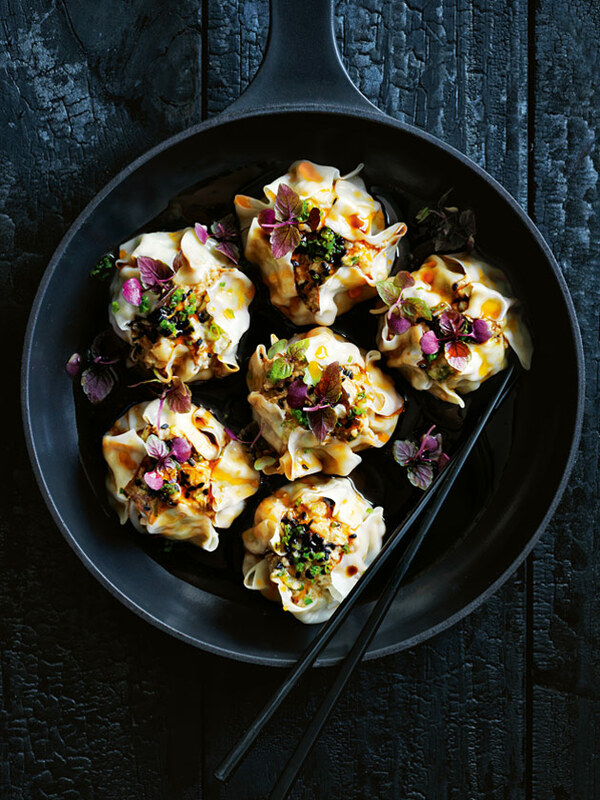 Place half the dumplings in a steamer lined with non-stick baking paper. Place over a wok or large frying pan filled with simmering water and steam for 6 minutes. Repeat with the remaining dumplings. Top with the shiso, chives and chilli oil (if using) to serve. Makes 16.